After making the Elderflower Cordial in my last post, I decided to use it to make a nice cool refreshing drink. I really enjoy making cordials, ice teas and mocktails over Summer and this one is no exception. I used the second Elderflower Cordial recipe from my last post to make this, however you could also use bought elderflower cordial. I wouldn’t use the first Elderflower and Lemon Cordial recipe from my last post for this one, as the lemon flavour would be too dominant. This recipe is also easily doubled if you have a crowd, and leftovers can be used to make ice blocks too. In a jug with at least 2L capacity, stir together the apple juice, elderflower cordial, rosewater and frozen strawberries. Top up the jug with chilled water (and ice if desired). Sprinkle a few fresh elderflowers over the top, or save them to decorate each glass. Once the strawberries begin to thaw the cordial will turn a pink colour. Store in the fridge, will keep for a 5-7 days. I have always been a fan of floral flavours, and elderflower is no exception. I have bought a couple of different brands of the pre made cordial, but had never had the opportunity to make it myself. Every Summer I would see those lucky enough to have access to elderflowers make batches of cordial, even use it to infuse alcohol. I even found somewhere online that sold small elderflower plants, though that idea was quickly vetoed due to the vigorous nature of the elderflower plant, and our genuine lack of space for new plants in the garden. This Summer however, I finally had access to some fresh elderflower - via the edible flower online store Petite Ingredient. About ten days ago, I received an email from them saying elderflowers were not only in season, but on sale too. At $9.95 a punnet, they were still pricey considering I would definitely need more than one punnet. I decided to just do it and buy some regardless. I couldn’t pass up the opportunity to actually get my hands on some fresh elderflowers and I was curious to see how the whole ordering fresh flowers online worked in practice. About a week later the elderflowers arrived. I had been eagerly awaiting their arrival and it was recommended that they go straight in the fridge once delivered. I had even briefed my Dad that they may be coming on a day I was at work, and said if they did to please put the whole thing in the fridge. Funnily enough they didn’t arrive that day, however an order from The Essential Ingredient did, so that ended up in the fridge instead! A few days later another order from The Royal Nut Company arrived (yes I have been shopping online a fair bit lately! ), and yes that ended up in the fridge too. I think any delivery that looks like it is food related may end up in the fridge if I’m not home from now on!! When my Petite Ingredient order did arrive I set about making my first batch of elderflower cordial, which included lemon zest and an infusion time of about 36 hours. If you go with this method (see below recipe one), and live in humid conditions, definitely allow the elderflowers to infuse in the fridge. This method gave a super lemony fragrance and flavour, however I was looking for a more pure elderflower taste. The second batch (see below recipe two) only called for elderflowers and water to to be infused overnight. Again I did this in the fridge. You can see the difference in colour both recipes produced and I have to say the second batch was my favourite. I have used this recipe to create another elderflower drink in the next blog post. I have included both recipes here, however I would recommend the second one. Both produce between 600-700ml of cordial which can be stored in a sterilised glass jar in the fridge for about a month. In a large bowl place the elderflowers and lemon zest and cover with the water. Ensure the elderflowers are submerged in the water. Allow to cool at room temperature. Once cooled, cover and place in the fridge (or other cool spot) for at least 36 hours. Once infused strain the mixture into a medium saucepan, pressing out as much of the liquid from the flowers as possible. The elderflowers and lemon zest can now be thrown out. Add the sugar and lemon juice to the liquid and heat on high heat for about 3 or 4 minutes, stirring until the sugar has dissolved. Once the liquid begins to simmer, remove from the heat and allow to cool before transferring to a sterilised bottle. Will keep in the fridge for about a month. Pick off all the elderflowers from their stems and add to a medium sized bowl. Pour over the water, cover and place in the fridge to infuse overnight. The next day, remove from the fridge and allow to come to room temperature for a couple of hours. Strain the liquid into a medium saucepan, pressing out as much of the liquid from the flowers as possible. The flowers can now be thrown out. Add the sugar to the liquid and allow to gently simmer on medium heat, stirring until the sugar has dissolved. Reduce the heat and cook for a further 10 minutes, until the colour of the cordial has turned golden and it has thickened a little. Allow to cool, then transfer to a sterilised bottle, or use to make this Elderflower, Strawberry & Rose Cordial. Will keep in the fridge for about a month. References: ‘The Modern Cook’s Year’ by Anna Jones (4th Estate, 2017), p.221; ‘Local is Lovely’ by Sophie Hansen (Hachette Australia, 2014), p.71. I’m quite late to the party on this one as I think Issue 10 has just been released, but I finally got my hands on Issue 9 of Cherry Bombe Magazine. This month I am loving all the lovely Spring flowers. I have enjoyed many a bunch of roses picked from our garden, and have picked a bunch of hydrangeas each week for the last four weeks or so. 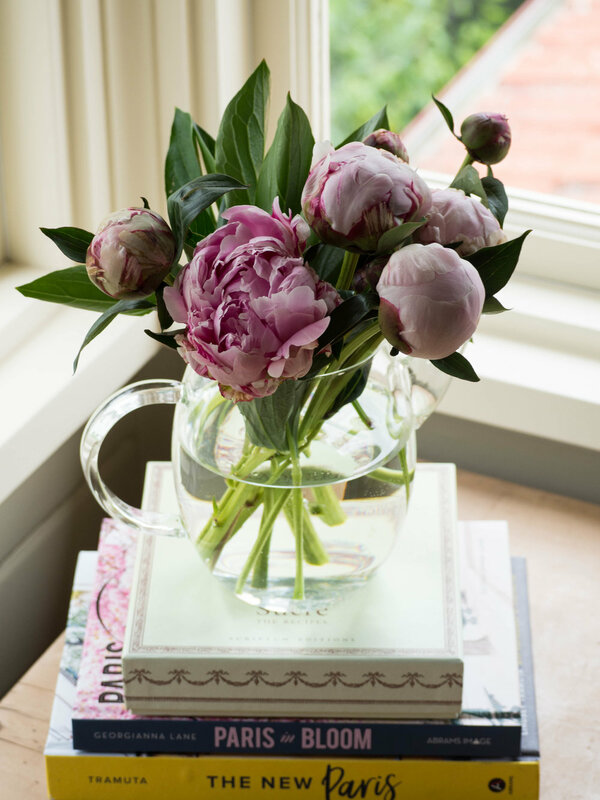 I also bought a small bunch of peonies and they are taking pride of place on my desk at the moment. Now that I am back working in the CBD of Sydney, I am enjoying popping over to the Food Hall in David Jones to check out all the lovely food and produce. I was excited to find they sell bagels and challah by Brooklyn Boy Bagels (my freezer is now stocked in case of a bagel emergency!). I finally started listening to this podcast and am so glad I did. Starting to think about Christmas and eyeing off all the cute festive things at Kikki-K. This cake is Summer on a plate for me. Elderflower and berries are Summer staples, and they both go so well in this cake. If you don’t have any elderflower cordial you can substitute it in the cake for lemon juice (so 180ml lemon juice in total). For the cake pictured in this post I used duck eggs (which are pictured in the above photos), because I can’t not buy them when I see them! I used 6 as they are much bigger than chicken eggs, and they gave the cake and amazing rise. It was the tallest chiffon cake I have ever made! Preheat oven to 180 degrees Celsius (or 170 degrees Celsius fan forced), and keep an angel food cake pan handy, but do not grease it. Add 165g of the sugar and the egg yolks to the bowl of a stand mixer, using the paddle attachment, beat for at least 5 minutes or until the egg yolks have become thick and pale in colour. While the egg yolks are beating, sift the flour at least 3 times to ensure it is well aerated. With the mixer on low, gradually add the elderflower cordial (100ml), lemon juice, 1 tbsp of the lemon zest to the egg yolks. Mix until combined. Sift the flour over the egg yolk mixture and gently fold in to the batter. Gently use a whisk if there are lumps of flour remaining in the batter. Using another large bowl fitted to a stand mixer, beat the egg whites using the whisk attachment until soft peaks form. Sift over the cream of tartar, then gradually add in the remaining sugar (165g), and whisk until the sugar has dissolved and the meringue mixture is stiff and glossy. Using a large metal spoon, gently fold the meringue mixture into the egg yolks in 2 or 3 batches, and stop mixing once everything is just combined. They key is not to over mix, as the air you have beaten into the egg whites will help give the chiffon cake it’s characteristic rise. Transfer the mixture into the ungreased angel food cake tin, and smooth the top with a spatula. Bake for 50 minutes or until a skewer comes out clean. Once the cake is done, invert it so the hole in the middle of the cake tin sits over the neck of a bottle. Leave like this until completely cooled - if the cake is not inverted once it comes out of the oven, it will sink. Once the cake has cooled, remove from the tin by carefully running a knife around the outside, middle and underneath of the cake. To finish the cake, beat the cream in a small bowl until soft peaks form. Add the remaining lemon zest and elderflower cordial and whisk to combine. Use the cream to decorate the top of the cake, finishing with berries and edible flowers. Reference: ‘Indulgent Cakes’ by The Australian Women’s Weekly (Bauer Media Books, 2014) pp.218-9.